An enormous new species of predatory dinosaur has been discovered in the fossil beds of southeastern Utah, paleontologists say, a “colossal” carnivore that was the apex predator of its day — even giving tyrannosaurs a run for their money. Though just a juvenile, the newly found specimen measured some 9 meters long and weighed at least 4 tons at the time of its death 98 million years ago. 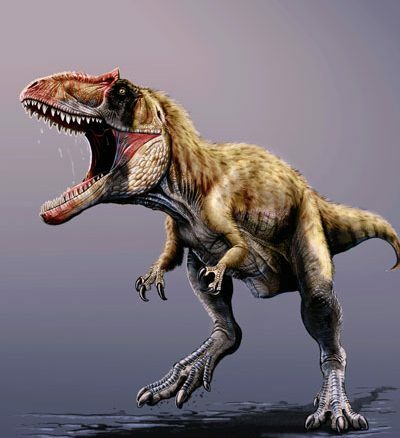 Adults of its kind were probably half-again as large, dwarfing the tyrannosaurs of its time, according to scientists. Instead, it was a member of the even rarer (and harder to pronounce) carcharodontosaurs, or “shark-toothed lizards” — a family of outsized carnivores represented in North America by only one other species. But that other species lived 10 million to 20 million years before Siats, making Siats something of a missing link in the order of succession of the Ancient West. 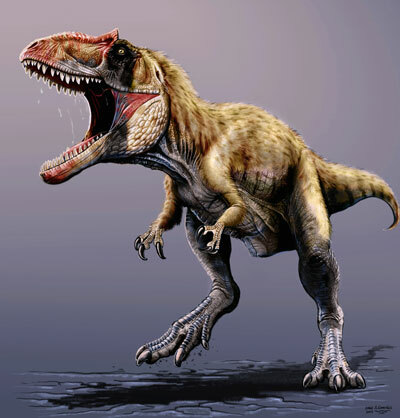 Siats‘ predecessor and fellow carcharodont, known as Acrocanthosaurus, was the top predator of its time in the Early Cretaceous, about 120 million years ago, paleontologists say. And while Tyrannosaurus rex bears the mantle of being the largest predatory dinosaur ever found on the continent, it didn’t come on the scene until about 68 million years ago. “Carcharodontosaurs reigned for much longer in North America than we expected,” said Dr. Lindsay Zanno, paleontologist at North Carolina State University who co-discovered the new species, in a statement. Indeed, she noted, it was probably when Siats and its fellow carcharodonts finally disappeared that tyrannosaurs were able to develop from relatively small, pesky predators into the likes of the Tyrant King for which their family is famous. “Contemporary tyrannosaurs would have been no more than a nuisance to Siats, like jackals at a lion kill,” she said. 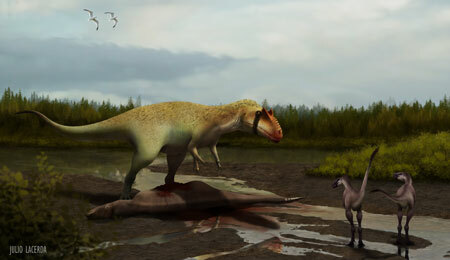 Zanno’s colleague in the find, Dr. Peter Makovicky of Chicago’s Field Museum, added that Siats‘ great stature probably kept the comparatively diminutive tyrannosaurs at bay as competitors. “The huge size difference certainly suggests that tyrannosaurs were held in check by carcharodontosaurs and only evolved into enormous apex predators after the carcharodontosaurs disappeared,” he said. In addition to helping flesh out the historical pecking order of Laramidia, the island continent that was the Ancient West, the newly found species may help experts better understand the coastal ecosystem that it called home. The Utah fossil beds where Siats was found in 2008 are replete with the remains of other organisms like plants, fish, crocodiles, and at least two more species of dinosaur that are likely new to science, the paleontologists say. Zanno and Makovicky describe their find in this week’s edition of Nature Communications. Join Western Digs on Facebook, follow @WesternDigs on Twitter, and follow us on Tumblr and Google Plus!